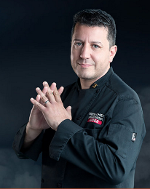 News Food Network’s Iron Chef America Judge & Italian Culinary Expert, Mario Rizzotti Kicks-Off “4 the Love of Italian Food Tour” across the U.S.
Chicago, Illinois (August 23, 2016) – As Italian food consumption continues to soar in the U.S., and remains our nation’s top cuisine, Food Network’s Iron Chef America Judge and Italian Culinary Expert, Mario Rizzotti, is setting out on an Italian food crusade. His goal: to help improve the health of Americans through the consumption of authentic, Italian food. Teaming up with chefs throughout the U.S., Mario will kick-off his “4 the Love of Italian Food Tour” in Sioux City, Iowa on August 28, 2016. The restaurant tour is designed to educate Americans on authentic Italian food products, helping them distinguish real from fake, and how these food ingredients can help reduce many health issues related to poor eating. The year-long tour will span across every state in the U.S., and in each state, will visit 4 cities, 4 restaurants, in 4 days. Rizzotti, a native of Rome, Italy, has been promoting authentic, Italian food products since he moved to the U.S. more than twenty years ago. After starting in the U.S. as a dishwasher in restaurants, Mario’s career in the culinary industry escalated. In 2002 he partnered with Academia Barilla, where he became an Italian Culinary Expert. Three years later he joined Food Network’s Iron Chef America show where he has been called to judge meals prepared by celebrity chefs, Mario Batali, Bobby Flay and more. The “4 the Love of Italian Food Tour” is targeted to smaller cities throughout the U.S. where Mario teams up with local chefs who have joined his crusade to co-host an authentic Italian dinner in support of good health. Restaurant guests will be introduced to dishes they may have never heard of before that will include ingredients that are true products of Italy. Each dinner event is themed around an authentic Italian food product, i.e EVOO (extra virgin olive oil). During the dinner Mario educates guests on how to distinguish authentic Italian products from fake, and how incorporating these ingredients into their diet every day can improve their overall health. Mario explains, “There are products that are what we call Italian sounding meaning they look and sound like real Italian ingredients but are not. In some cases, Americans are getting completely ripped off. They think the extra virgin olive oil they use is good for them, where in reality, a large percentage of extra virgin olive oil sold in the U.S. is not really extra virgin. It could be loaded with fillers that can do more harm than good, like partially hydrogenated soybean oil which is a trans-fat. Sometimes the olive oil is made from rancid olives, which have lost almost all their health benefits. I started out helping people understand the difference between real Italian products and fake, now my journey has new meaning. I love the United States but see a country that is eating themselves sick through poor food choices. Diabetes, obesity and high blood pressure are increasing even in our youth. Right now Americans are in a love affair with Italian food which is great. I don’t have to persuade them to embrace Italian cuisine, I just have to teach them how to select the right products for better health, and remind them to consume their authentic EVOO every day”. Mario will be in Lincoln Nebraska, Monday, August 29, 2016. He will be teaming up with Chef Jay Donaldson at The Flatwater at 6:45pm as they co-host an authentic Italian dinner. Those interested in attending the event should call The Flatwater: 402.435.1426 to reserve a seat since seating is limited. Mario Rizzotti is an acclaimed television personality and Italian culinary expert who lives by one simple motto, “a meal is not the consumption of food, but rather a celebration of Dolce Vita”. TV audiences know him best as the seasoned yet approachable judge on The Food Network’s “Iron Chef America”, where he was called to judge Iron Chefs like Mario Batali, Michael Symon, Marc Forgione, Bobby Flay, Masaharu Morimoto and more. After leaving Rome, Italy in his early twenties, Mario moved to the U.S. and has been educating food lovers everywhere about authentic Italian ingredients. As Italian Culinary Expert for Academia Barilla, Mario helped consumers understand the differences in olive oils, balsamic vinegars, Italian cheeses and cured meats, and how to distinguish real Italian products. He has been asked to Emcee and judge at numerous culinary events including Chicago Gourmet, Gelato World Tour, Bellavita Expo and more, and is often sought after for advice when chefs open new restaurants and create new menus. Mario resides outside of Chicago with his wife and three children.